15% off all handmade items at KKL Primitives Selling Blog, July 1st through July 5th. Sale price will be applied to invoice when order is placed. 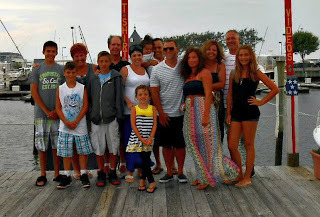 We just returned from 2 weeks at the Jersey shore. Had a wonderful vacation with great weather. Returned home to a at least a week's forecast of rain. Neighbors said it rained nearly the entire time we were away. Grass is lush and green, normally our lawn is fried when we get home. Some photos of our vacation: The family did some biking on the boardwalk. Of course I'm taking the photo, so I'm not in this one. Back to front- Tom's sister Caren, our daughter Carey and her husband Ammar, Tom in the white t-shirt riding his own bike, Caren's daughter-in-law Beth holding daughter Heidi and Caren's son next to them, Ayden Grace and Bella in the front basket and Nicki's boyfriend Bob. My step-grandsons on either side of me with grandson Jonah in front of me. Grandaughter Jordyn extreme right. What a wonderful looking family...very handsome - all of you. And what a great vacation - oh how I wish that would happen for us - years ago we could get synchronized so we could all go together but not anymore.